Most of the prisoners on Oregon's death row suffer from significant mental impairments, according a study released on December 20, 2016 by the Fair Punishment Project at Harvard University. 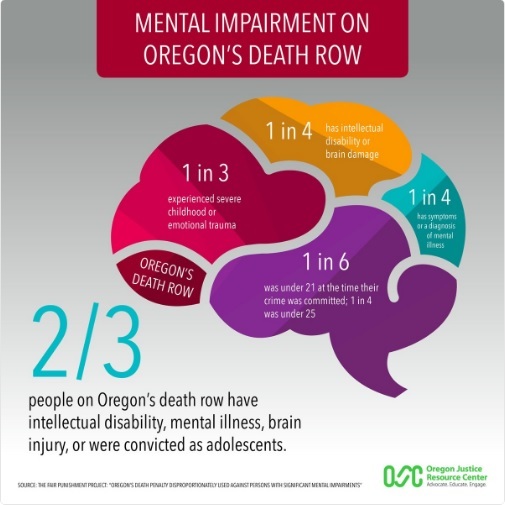 The Project's analysis of case records, media reports, and opinions of Oregon legal experts found that two-thirds of the 35 people on the state's death row "possess signs of serious mental illness or intellectual impairment, endured devastatingly severe childhood trauma, or were not old enough to legally purchase alcohol at the time the offense occurred." The report argues that these characteristics make the prisoners less culpable than the average offender. "[T]he U.S. Supreme Court has held that regardless of the severity of the crime, imposition of the death penalty upon a juvenile or an intellectually disabled person, both classes of individuals who suffer from impaired mental and emotional capacity relative to typically developed adults, would be so disproportionate as to violate his or her 'inherent dignity as a human being,'" the report says, drawing parallels between those classes and the prisoners included in the report. The study found that 9 of the 35 death row prisoners (26%) "presented evidence of significantly impaired cognitive functioning as evidenced by low IQ scores, frontal lobe damage, and fetal alcohol syndrome"; approximately one in four exhibited symptoms of mental illness, or had a confirmed mental health diagnosis; one-third suffered some form of severe childhood or emotional trauma of the sort known to affect brain development; and six (17%) were under the age of 21 at the time of the offense. In one case, an Oregon death row prisoner was granted a hearing to determine whether he is intellectually disabled after evidence showed he has a psychotic disorder, partial fetal alcohol syndrome, visible brain defects in his corpus callosum, a low IQ, and deficits in adaptive behavior that left him functioning at the level of a seven-and-a-half-year old child. His co-defendant, a childhood friend who admitted that he had exerted pressure on the first defendant to participate in the crime, was given a life sentence. The report concludes, "These findings raise a legitimate question as to whether Oregon’s capital punishment scheme is capable of limiting application of the death penalty to the most culpable offenders." Oregon currently has a moratorium on executions, and has executed just two people in 40 years. The NAACP Legal Defense Fund reports that America's death rows have continued to decline in size, with 2,905 men and women on death row across the United States as of July 1, 2016. The new figures, reported in the organization's Summer 2016 edition of its quarterly publication, Death Row USA, represent a 14% decline from the 3,366 prisoners who were on death row one decade earlier. The shrinking of death row populations across the country has exceeded the number of executions during that period, meaning that more prisoners have been removed from death row as a result of having their convictions or death sentences overturned than have been added to the row with newly death-sentenced prisoners. The nation's largest death row states remain: California (741), Florida (396), Texas (254), Alabama (194), and Pennsylvania (175). Nationwide, 42.34% of death row inmates are White, 41.79% are Black, 13.08% are Latino/a, and 2.78% are other races, but racial makeup varies by state. Among the most racially-disproportionate death row populations are Delaware (78% minorities), Texas (73% minorities), Louisiana (70% minorities), Nebraska (70% minorities), and California (66% minorities). Only 55 death row prisoners (1.89%) are women.